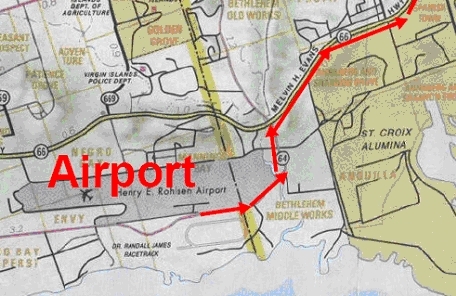 NOW with New, Faster Route for Airport to Coakley Bay -- Via the Christiansted BYPASS ! To get to Coakley Bay from Christiansted, first find the Fort on the waterfront -- it is impossible to miss. (It is at the bottom of King Street, where it meets Hospital Street -- but you can ask anyone.) The road that passes in front of the Fort is called Hospital Street while it is in town, and is called the East End Road as it leaves town. Wherever you are near Christiansted, if you are looking at the water, that is North. You want to head East out of town on Hospital Street (East End Road). 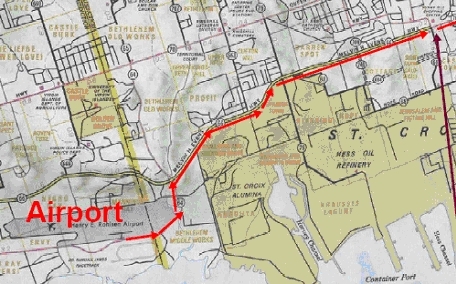 (Note: It may be marked 'Route 75' just as it starts to leave town -- but that will turn into Route 82.) It doesn’t run West, so you can’t get going the wrong way. Better yet, except for two quick turns that you cannot miss, this will take you right to Coakley Bay! 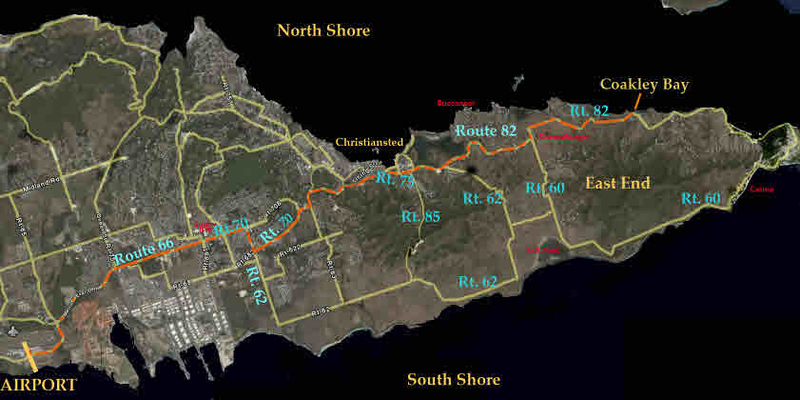 Below are 2 different looks at the route you will be taking. In less than a half mile, you will pass the intersection for the BYPASS, and then, on your right....the baseball field and tennis complex. The SeaSide Market will immediately be on the left. Stay on that road. About a mile further on, you will see the entrance to the Buccaneer Hotel and Golf Course on the left as you go around a fairly sharp right curve -- just keep going past it. About a mile further, you will reach a "T" where the road dead-ends into (Route 60) and you are forced to turn. 1. Go back to the entrance and turn Left onto the East End Road -- headed West toward town. 2. At Cheeseburger in Paradise, turn left, and in a quarter mile, instead of going straight, turn right -- onto Route 82. 3. You will pass the entrance to the Green Cay marina (where the Galleon Restaurant is located) on your right. You will pass the entrance to the Buccaneer Hotel and Golf Course (and its Terrace Restaurant) on your right, a gas station at an intersection on your right, a small school on your left, and then you will come over a small rise and see a bright yellow gas station on the left with a little plaza on the right. The "SeaSide Market" is in that little plaza on the right. Like a small, island version of Citerellas. Best meats, bakery, etc. (In the Gallows Bay area behind that market, you will find the Post Office, hardware store, garden store, appliance store, computer store, etc.) The you will come to the BYPASS intersection -- do not turn left -- just go straight through the lights. 4. If you kept going straight, in about a 1/2 mile, you will be in Christiansted. 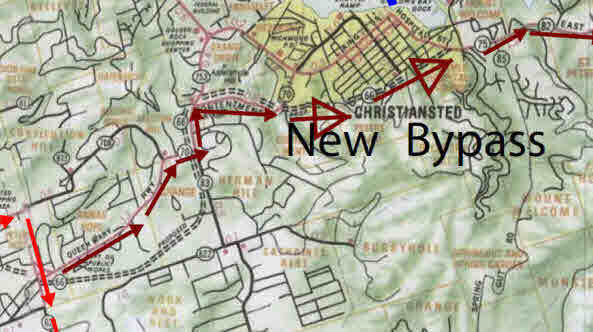 (Before you get there, you will pass both the Bypass Intersection and then (Savant) on the right. 1. Use this route if it is your first time, especially at night! When leaving the Airport parking area, after you pass through the booth for paying the parking fee, you will go left. Be careful, as traffic will be on the LEFT side of the street. Before we start to navigate...take a look at the map below to get the general idea of where you are going. . .the Airport is in the lower left (it is on the South Shore at about Mid-Island). 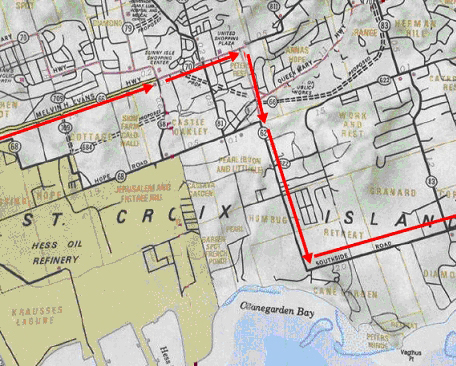 You are going to Coakley Bay which is on the North Shore on the East End. 2. In less than a mile you will go around a left curve and come to a stop light. At that light you will turn RIGHT onto a divided highway. (That is the "Melvin Evans" Highway -- Route 66 -- and you will be headed East.) Make sure you go to the left lane. 3. This will stop being a divided highway at a light -- you will see the "Sunny Isle" Shopping Center ahead and on the left. This is still Route 66. 4. Just keep going straight, past the shopping center. Shortly, after passing through another traffic light, you will then pass the "United" or "Sion Farm Shopping Center" and then the "Plaza Extra" supermarket which will be on your left. Squint at the map below -- see where it says "United Shopping Plaza." That is the big Plaza Extra Supermarket. Can't miss it. 5. Just 200 yards after that United Shopping Center/Plaza Extra, you will have an option to go straight or sweep around a curve to the right (the right turn will put you on Route 62 - heading to the South). Go around the curve to the right. If you incorrectly go straight you will soon pass a small furniture store (the Brass Key) on the right. Go back and turn left. 6. Once you have rounded the curve to the right, you will pass a bank and a small row of stores (including FedEX) on your right. Just past this take the curve to the left...and come to an intersection where traffic will be merging from your right side. Stop. Merge to your left. 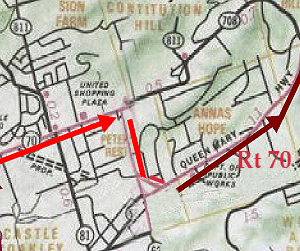 You will immediately pass a gas station on the right -- this is the Queen Mary Highway, and may be marked either Route 66 or Route 70. In about 3 minutes You will go around a right curve then past the Beeston Hill Gym, and then take the left curve just past the Church on your left. 7. You will then come to a fork in the road where you can go straight (Route 753) or bear right (staying on Rt. 70) -- go right -- you will now be going down a hill on Route 70. From here on out, it is really easy. 8. At the bottom of the long, curving hill you will arrive at the new BYPASS. At the traffic lights, go straight onto the bypass and stay on it for about a mile. After going down the long hill to the left (curve) -- at the bottom you will come to the traffic lights where the Bypass ends. TURN RIGHT. 11. You will almost immediately pass the baseball field and tennis complex on the right, and then the SeaSide Market will be on the left. Stay on that road. You will pass an elementary school on the right and a gas station on the left. About a quarter-mile further on, you will see the entrance to the Buccaneer Hotel and Golf Course on the left -- just keep going past it. About a mile further, you will reach a "T" in the road (Route 60) where you are forced to turn. 12. At that turn, (Southgate) make a left. In 300 yards at a really ugly cell-tower (you will also see Cheeseburger in Paradise on your right) another turn has to be made. Turn Right. A mile and a half of somewhat winding road later, you will be at the entrance of both Coakley Bay Condos (on the Right) and Carden Beach Condos (on the Left). If you are driving in the daytime, you will see the high, pink buildings on your right far before you reach them! 13. 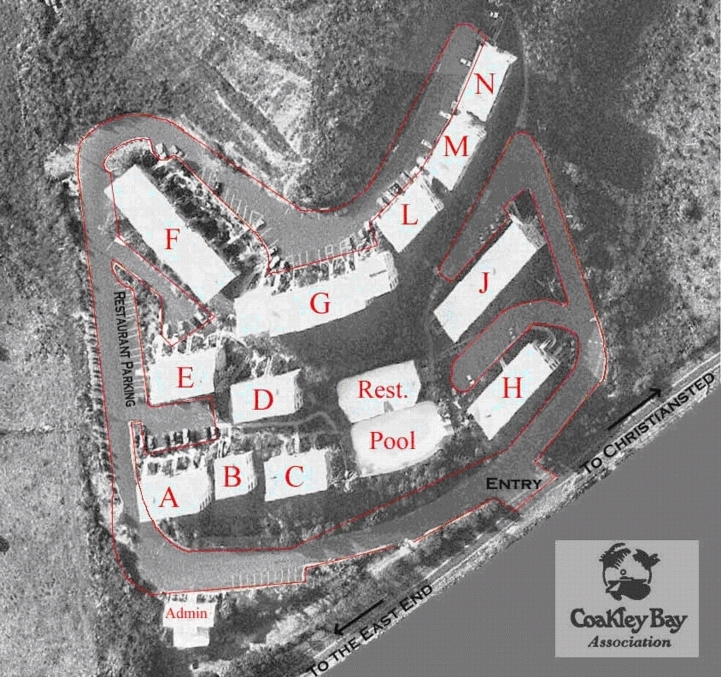 Turn Right off the East End Road into Coakley Bay -- and make the immediate left for the Management Office, pool, Cultured Pelican restaurant -- as well as Buildings A through G and L, M and N. (Turn right after entering only for Buildings H and J.) If you turned left, in 200 feet on the left you will see the Management Office and Spa/Salon. Just after that you will bear right around a curve and start to go up a hill. The Cultured Pelican Restaurant and the pool are just through the first parking area on the right -- although we ask that restaurant visitors not park directly in that first small lot, please note the signs. 1. Don't use this route if it is your first time, especially at night! When leaving the Airport parking area, after you pass through the booth for paying the parking fee, you will go left. Be careful, as traffic will be on the LEFT side of the street. Before we start to navigate...take a look at the map below to get the general idea of where you are going. . .the Airport is in the lower left (it is on the South Shore at about Mid-Island). 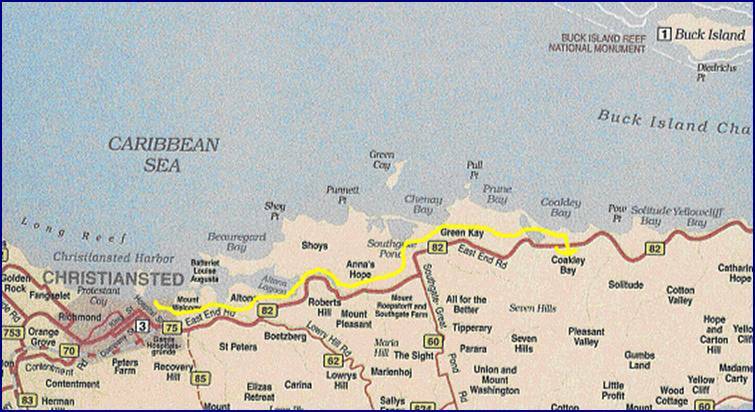 You are going to Coakley Bay which is on the North Shore on the East End. 4. Just keep going straight, past the shopping center. Shortly, after passing through another traffic light, you will then pass the "United" or "Sion Farm Shopping Center" and then the "Plaza Extra" supermarket which will be on your left. Look at where the Blue "X" appears below the word "Here". That is Plaza Extra. 5. Just after that shopping center and Plaza Extra, you will have an option to go straight or sweep around a curve to the right (the right turn will put you on Route 62 - heading to the South). Go around the curve to the right. If you incorrectly go straight you will soon pass a small furniture store (the Brass Key) on the right. Go back and turn left. 6. Once you have rounded the curve to the right, you will ignore the next curve to the left in about a quarter mile...and instead, immediately, come to an intersection. Be careful of the right of way when crossing the lanes coming from the left hand curve -- they have the right of way there. Then stop. Go straight through the intersection. You will pass a lumber yard which will be on your right. 7. In about a mile, you will come to a place where you have to turn left....turn left. 8. This is Southside Road, and you will be following it for quite a while -- enjoy it, some of the views are spectacular. Be careful, don't hit cows, runners or people on bicycles. 9. You will come to a place where you have to take a sharp left curve -- the Boy Scout Camp will be on your right just before you reach that point. You cannot miss it. See the Blue "X" above the word "Here" in the picture below -- that is the Camp. 10. Just after that, in less than a quarter mile you will reach an intersection where you can go straight or turn right. Turn right -- that will be Route 624. 13. In just a quarter mile past that intersection, on your right you will see "Cheeseburger in Paradise" and you will have to take a right turn. 14. You are now on the East End Road headed East -- this is the road Coakley Bay is on. 15. You will go around several curves including a very sharp one to the right followed by a hard left which leave you on a long straightaway. On the left, you will see a bright mustard yellow House behind a Black iron fence. 16. Just after that, you will arrive at the entrances to Cardin Beach (on the left) and Coakley Bay (on the right).